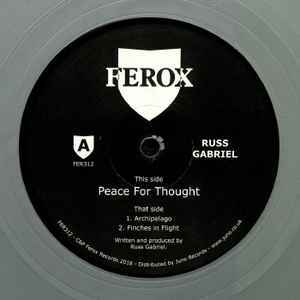 If there is a track that can be called a masterpiece of deep techno, then Peace for Thought is definitely the one. Have listened to it countless times since its original release. Glad it's re-released! Finally a repress. For nearly 20 years I have wanted Peace for Thought but the record was alwaya going for at least 60 dollars for a well played copy. 27 years later we get it playing at 45rpm all one side. Big ups to who made that decision. More represses need to this. Press at 45 for the track that is the reason and fill in the gaps from there. Not only did Russ do this but he did it with 2 new standout tracks! A perfect balance to side A you have an excellent full little ep. A well pressed record, Peace for Thought is pressed a touch too loud. Since it plays at 45 the crescendos dont clip or distort or anything but it seems a couple decibels too loud. Really close. But this is minor. This is worth every penny. One of the most beautiful, mesmerizing techno tracks ever made .... 25 years ago , today and 25 years ahead ....... thx Russ !